The idea of the SE is to provide a company with a large degree of flexibility and mobility within the European internal market. For this reason, the SE can transfer its seat to a different EEA member state. This transfer of seat does not result in the winding up of the SE nor in the creation of a new legal entity (SE Regulation, Art. 8). In the meantime, 67 SEs have moved their seat into another country. At least 21 belong to the group of normal SEs. To date, no case is known in which the transfer of seat has resulted in a reduction or withholding of participation rights. The registered office must remain in the country where the SE’s head office is located. That means that the head office (administrative seat) must also be relocated. The SE regulation does not allow the transfer of seats outside EU/EEA territory (for example, to the Cayman Islands or to Switzerland). In this case the SE is dissolved. A public limited liability company that converts into an SE is not allowed to transfer its registered office at the same time as the conversion is effected (SE Regulation, Art. 37). The Directive thereby wants to ensure that the transfer of seat is not used to ‘escape’ from an existing participation arrangement. Once the SE is established it can, however, move its seat to another country (the participation arrangement will remain in place). The ECDB data reveals that between October 2004 and December 2012, ca. 4 per cent (67) of the currently registered SEs1 migrated to another EEA country, sometimes immediately after their registration. The map below shows the outward and inward transfers per EEA country. Hence, the highest net inflow (incoming SEs minus outgoing SEs) can be observed for the UK (+10 SEs), Austria (+7), Cyprus (+6), and France (+4). In contrast, the highest net outflows occurred in the Netherlands (–12), Denmark (–5) and Germany (–4). Luxembourg is the most dynamic place with a total of 24 SE transfers of seat, of which 14 were outbound and 10 inbound. Surprisingly, the Czech Republic with its total of 1,055 SEs accounts for only 6 transfers of seat. Whereas employee participation apparently seems not to have constituted an important driver for SE mobility, at least in some cases tax reasons are likely to have played an important role. The motives, however, usually remain unknown as they are generally not made public by companies (and even if they were, there could be no certainty that they were the real drivers). 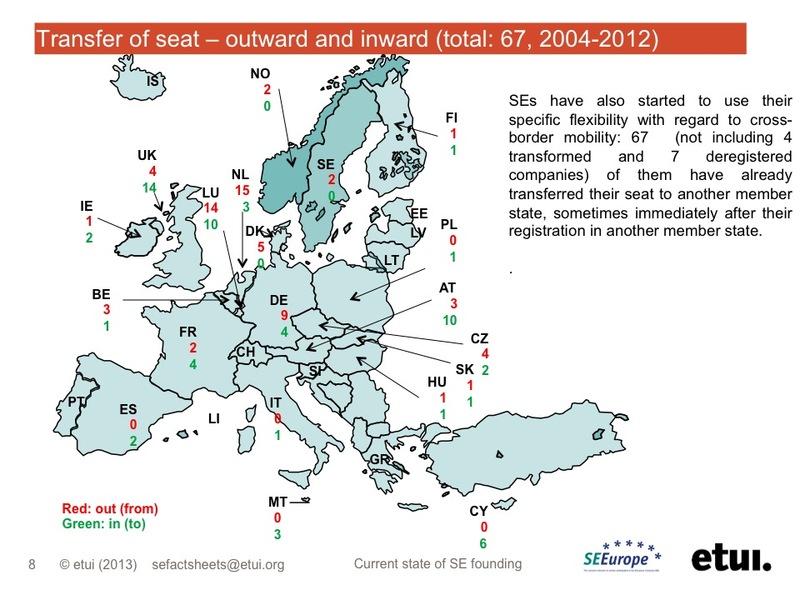 Out of the 67 currently registered SEs that have transferred their seat, at least 21 belong to the group of normal SEs. To date, no case is known in which the transfer of seat has resulted in a reduction or withholding of participation rights. Another new possibility created by the SE is that it does not need to have legal entities in every country it operates in. It can also work with establishments/branch offices instead of by merging national legal entities into the parent (SE) company. This can be carried out at the moment of founding (merger SE) and also later on (and irrespective of the original form of founding). SE founding has so far been used only rarely as a tool for cross-border mergers within or between large companies with employees in many European countries. Basically, all larger SEs have preferred not to merge (all) their national subsidiaries into the new SE parent company immediately. Instead, usually only the parent company was transformed into an SE and the national subsidiaries continued to exist as separate, legal entities. However, also later on an SE can still merge its national subsidiaries into the SE parent company. The latest developments – for example, in some SE subsidiaries of Allianz SE – might indicate that this merging of subsidiaries may increase in the future. The absence of a legal entity can indeed have an impact on national rights: for example, if a national subsidiary ceases to exist as a legal entity the board-level participation in the subsidiary ceases as well. There is then participation only in the parent (SE) company. Also, other national rights granted to the union and/or works council that require the existence of a national legal entity may be threatened. Indeed such a concern comes from France. Here, mainly the trade unions have expressed their concern with regard to the fact that some French involvement rights are directly connected to the existence of a national legal entity in France. This article largely draws on the followings article: Stollt, M. and M. Kelemen (2013) ’A big hit or a flop? A decade of facts and figures on the European Company (SE)’, in: Cremers, J., M. Stollt and S. Vitols (ed.) (2013) A decade of experience with the European Company, Brussels: ETUI.